A platinum engagement ring set with stunning diamond possesses a brilliance and dazzling colour that last forever. BAUNAT engagement rings are handcrafted using solely materials of exceptional quality, resulting in an excellent price/quality ratio. The engagement rings are also available in a range of other precious metals, such as white gold, yellow gold and red gold. Why should I choose a platinum engagement ring? Platinum is an exceptionally durable metal that keeps its colour and shine forever. What could be a better symbol for the engagement between you and your partner? Moreover, we at BAUNAT guarantee that all our jewels are made using only the highest quality materials. 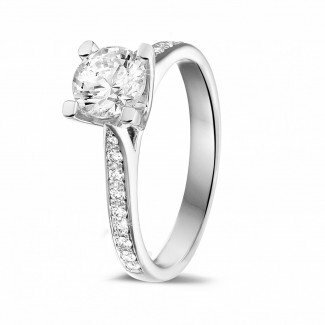 With a platinum engagement ring set with stunning diamonds, you choose the best price/quality ratio. When you are going to propose, you surely want an engagement ring that symbolizes the unique bond between you and your beloved. If you cannot find the perfect platinum engagement ring in our collection, you can choose for our tailor made approach. We will be happy to guide you throughout the creation process, from rough draft to finished product. This way, you have the ring of your dreams to propose with. Can I order my engagement ring online? BAUNAT’s complete collection is available online. If you have already made your choice, it is not really necessary to visit one of our specialized showrooms. 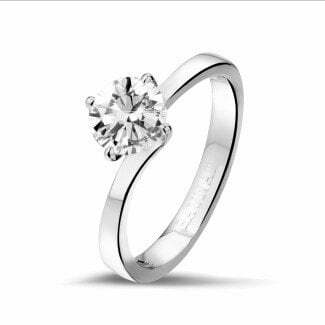 Instead, you can simply buy your platinum engagement ring online. Whichever you choose, because we are an online brand, you save up to 30 or 50% compared to your local jeweller. We also offer our clients free shipping, as well as 30 days in which to change their minds. This way, you can exchange your engagement ring in case is does not fully meet your expectations.